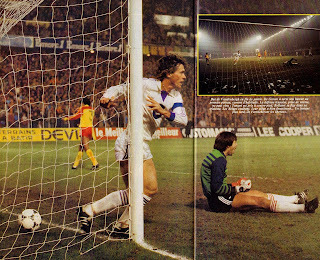 Anderlecht and RC Lens were paired in the Third Round of the 1983/84 UEFA Cup. 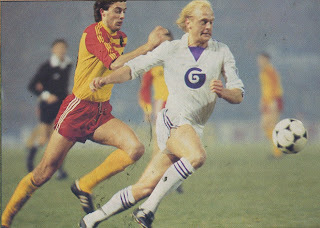 The Belgian Club Anderlecht, managed by the former star Paul van Himst, were the defending Champions of the trophy and one of Europe’s stronger teams. 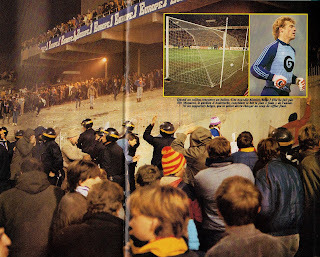 The squad contained many Internationals from different nations which included Belgians Frankie Vercauteren, Erwin vandenbergh, Rene vandereycken , as well as a large Danish contingent led by Morten Olsen and Frank Arnesen. They had qualified from their opening Rounds by defeating Norway’s Bryne (3-0 away, 1-1 ) and Czechoslovakia’s Banik Ostrava (2-0, 2-2 away). 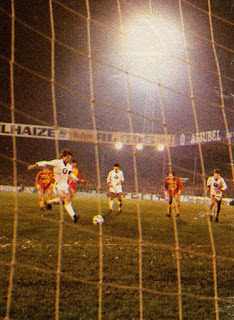 France’s RC Lens had not played in Europe for over 5 years. They were managed by a young Gerard Houllier, who was starting to make a name for himself. 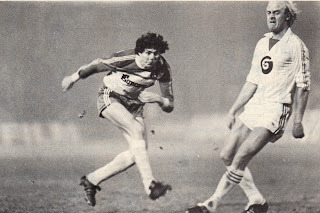 The jewel in the crown of the squad was young midfielder Phillipe Vercruysse, who many were predicting a bright future. Also on board, were Olympic team Internationals such as defender Didier Senac and strikers Francois Brisson and Daniel Xuereb. They had qualified from their opening Rounds by defeating two Belgian squads: Ghent (1-1 away, 2-1) and Antwerp (2-2, 3-2 away) and were about to meet a third Belgian side. But this Belgian squad was clearly superior to the previous ones. 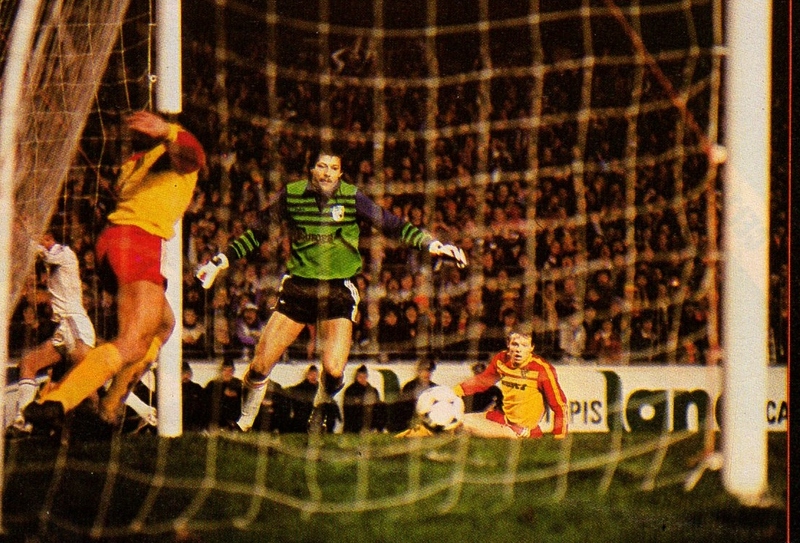 The first leg, on November 24th, was played at Lens’ Stade Félix-Bollaert. Lens playing at home, employing a 4-3-3 formation took the initiative. Roman Ogaza had been carrying an injury, as a result Pascal Peltier started as central striker flanked by wingers: Francois Brisson and Daniel Xuereb. Despite their positive intentions, Lens were unable to break through and finish their moves, as Anderlecht were a more organized and experienced squad. With the match seemingly headed for a scoreless draw, Anderlecht snatched a goal with two minutes to go. 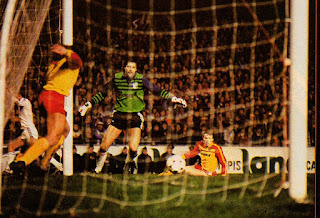 Frankie Vercauteren from the center of the field released De Groote on the left side who sent a low pass into the box for vandenbergh to score. At this point, the match seemed to have been decided, however, an incident changed the course of the tie. 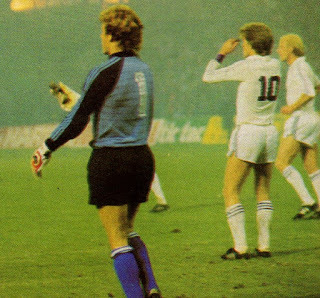 In injury time after Anderlecht had cleared a Lens attack, Kenneth Brylle sent a backpass to his goalkeeper Munaron to keep possession. 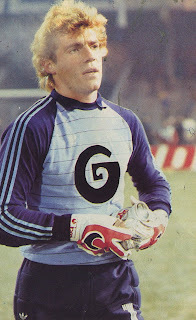 Morten Olsen allowed the ball to pass through his legs for Munaron to pick up. What seemed like a routine play suddenly turned into an own goal . Munaron tried to control and pick up the ball with his foot and suddenly the ball rolled into the net. 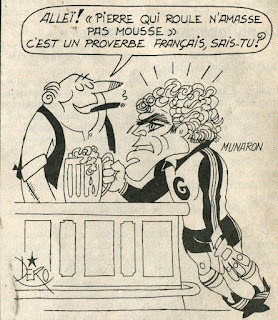 At first it was not apparent what had occurred, it seemed like Munaron had made an error and the Television replays were also not very clear at first. However, with clearer analysis, it was clear that as soon as the ball entered the net, Munaron picked up an object (which turned out to be a rock) and tried to show it to the referee. Munaron and the Anderlecht players tried to appeal to the referee that the rock had changed the trajectory of the ball. But it was to no avail as the referee validated the goal, since himself and the linesman had not seen anything. In any case, according to the laws of the game any and all foreign objects had to be removed from the field for play to continue, so the goal should have been called off. As he was leaving the field, Munaron carried the rock in question as well as beer cans thrown on the field. He was so angry that when French TV reporter Phillipe Houy tried to interview him as he was leaving , he refused his request and just walked off. 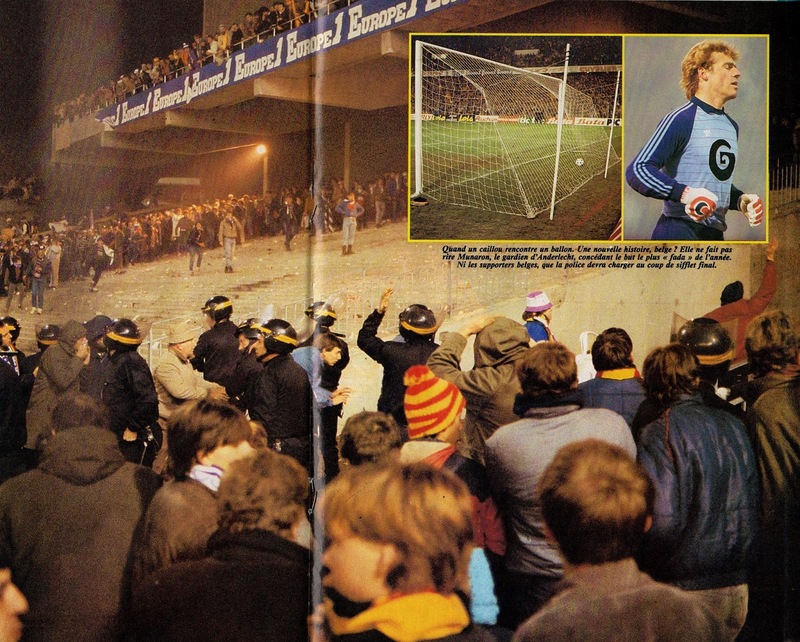 After the match there was crowd trouble and police and security forces had to intervene. Houllier considered his team’s play better and was hopeful for the return leg. He said they have to attack in Brussels, as it was the only solution. Despite the fluke goal, a draw seemed like a fair result. The second leg, on December 7th , was played at Brussels’ Parc Astrid. For Lens, Rene Marsiglia started in place of Jean-Pierre Bade, otherwise the squad was unchanged. Pascal Peltier once again deputized for Roman Ogaza. Anderlecht started with the same lineup. The day before the match it had been announced that Anderlecht’s Walter De Greef would miss the match. However, on the day of the match he was declared fit. This led Houllier to remark that here it’s like in France, players are injured before and after matches but on the day of match by miracle they are ok to play. Anderlecht showed its strength and dominated the proceedings and only one outcome seemed certain. In the 22nd minute, Daniel Xuereb saved on the goal-line from a Czerniatinski attempt. Initially it seemed like the ball may have passed the line, but no goal was given. After many chances Anderlcht broke the deadlock in the 38th minute. Rene vandereycken from the center sends a ball to the left side for Vercauteren who takes a shot. 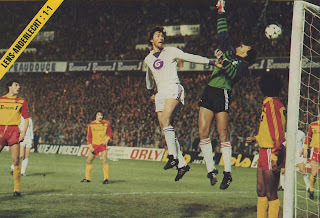 The ball is parried by Tempet and then Vercauteren attempts an overhead kick with the deflected ball. The loose ball is laid on by Czerniatinski to De Greef who takes a shot to the roof of the net. In the second half, De Greef came close again with a header that hit the post. 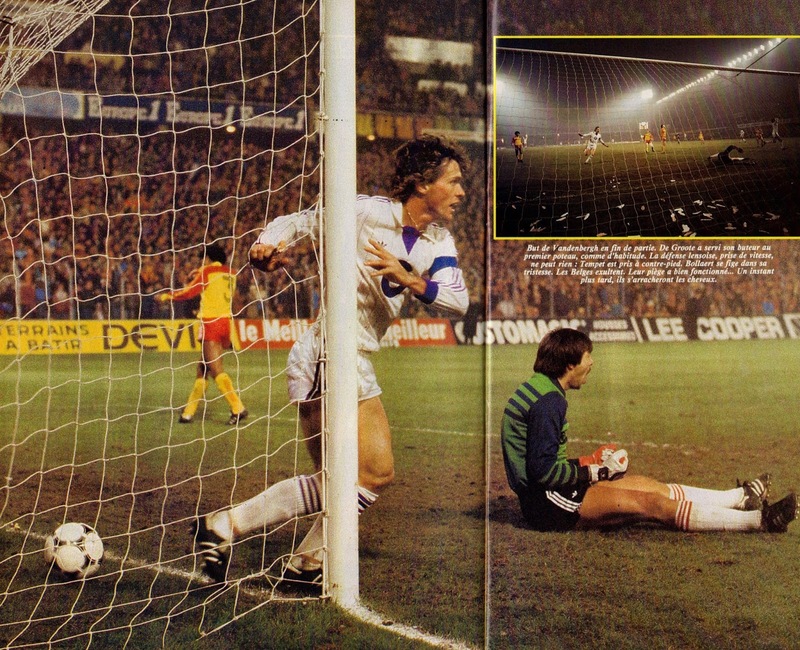 Anderlecht were awarded a penalty kick in the 63rd minute when Hofkens was fouled in the box. A foul that injured Hofkens and forced him off. 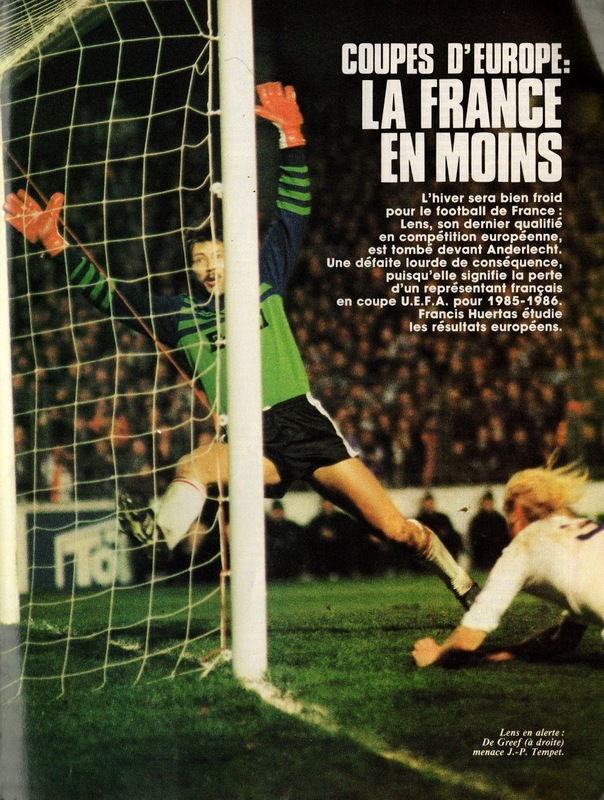 Frankie Vercauteren’s attempt was saved by Tempet. Anderlecht deservedly won the match by the slimmest margin and qualified for the quarterfinals. Houllier named De Greef as the Anderlecht’s best player and said with him out, Lens would have won. 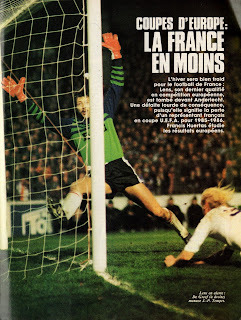 He went on to blame the French calendar for his side’s elimination. He mentioned that French teams had already played 21 League matches up to that point, while Belgians were fresher with only 15 matches played. Lens’ sponsor ‘Europe 1’ gave each Lens player a VCR as a gift. 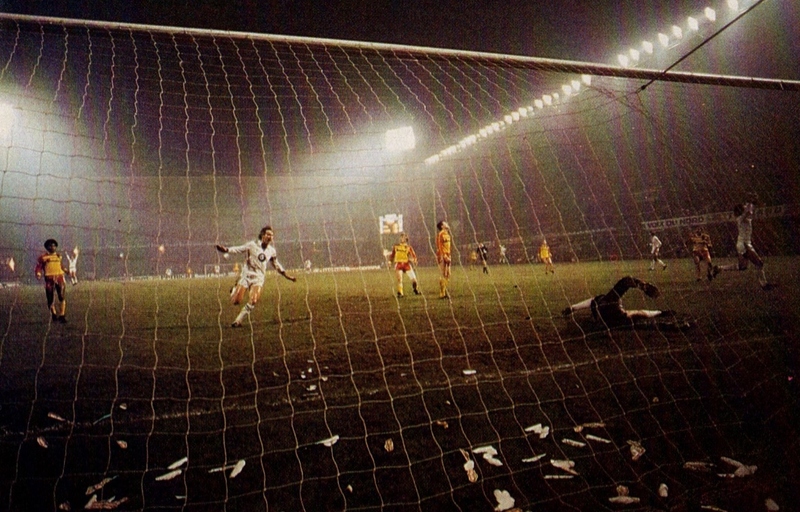 Anderlecht went on and qualified for the Final of the UEFA Cup, but were defeated by Tottenham Hotspur in the Final. 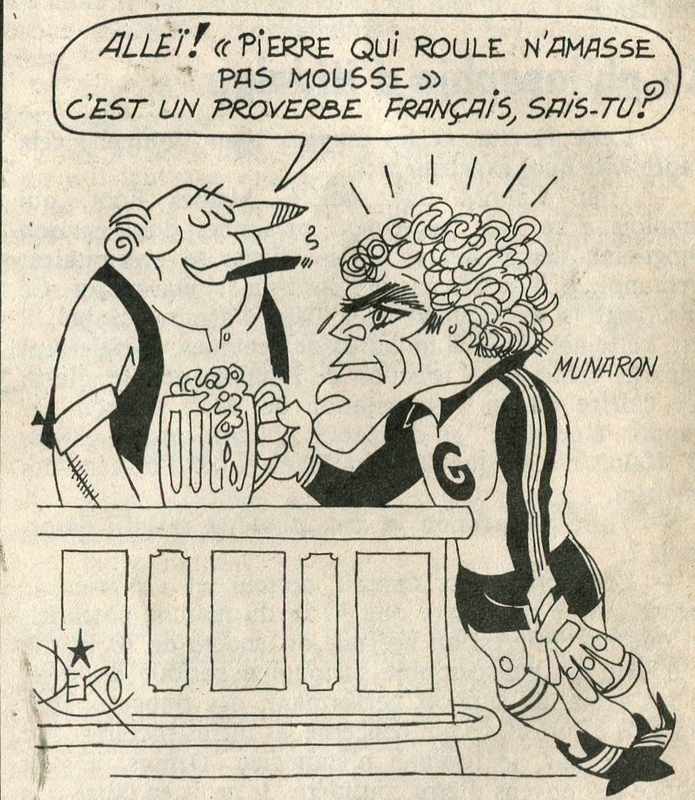 Lens’ Senac, Xuereb and Brisson had a more memorable end of season as they were instrumental in France winning the 1984 Olympic Title in the Los Angeles Olympics.